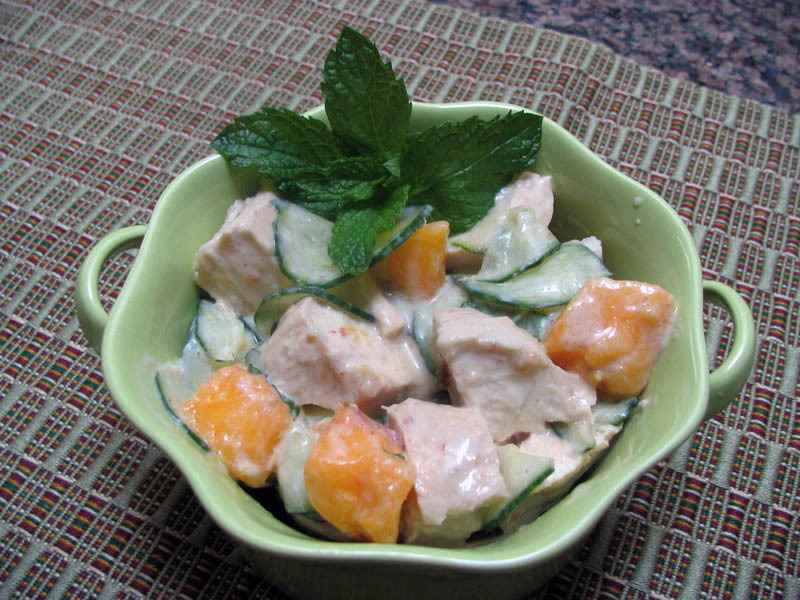 A PEACHY SALAD FOR A SUNNY DAY! The end of August makes me apprehensive, because Summer is my favorite season. But in the Southwest the heat lingers on, so we remain in the mood for light, refreshing food. 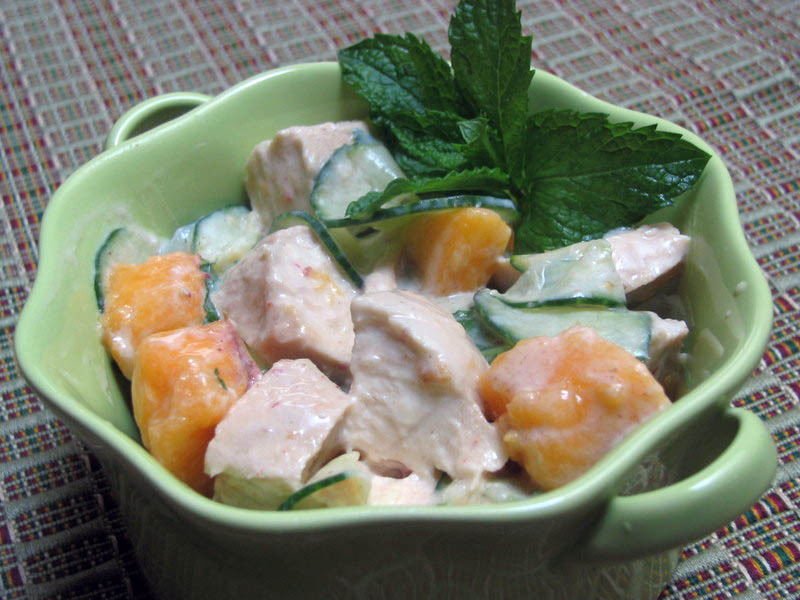 This salad is a great example, in that it contains only 3 ingredients: chicken breasts, peaches and cucumbers, plus a tasty mix of yogurt and spices that joins them together. This recipe was in my “to make soon” folder for a year (shame on me! ), since I first saw it in the popular food blog Just Bento. Start by poaching the chicken. In a pan large enough to hold them in a single layer add enough water to barely cover the pieces, mix in the soy sauce, ginger, salt and parsley. Add the chicken breasts and bring the liquid to a boil. Once it boils, immediately cover the pan and remove it from the heat, leaving it undisturbed for 15 minutes. Remove the chicken breasts, discard the cooking liquid and allow the meat to completely cool. Cut them into chunks. Using a mandoline, cut the cucumber into paper-thin slices. 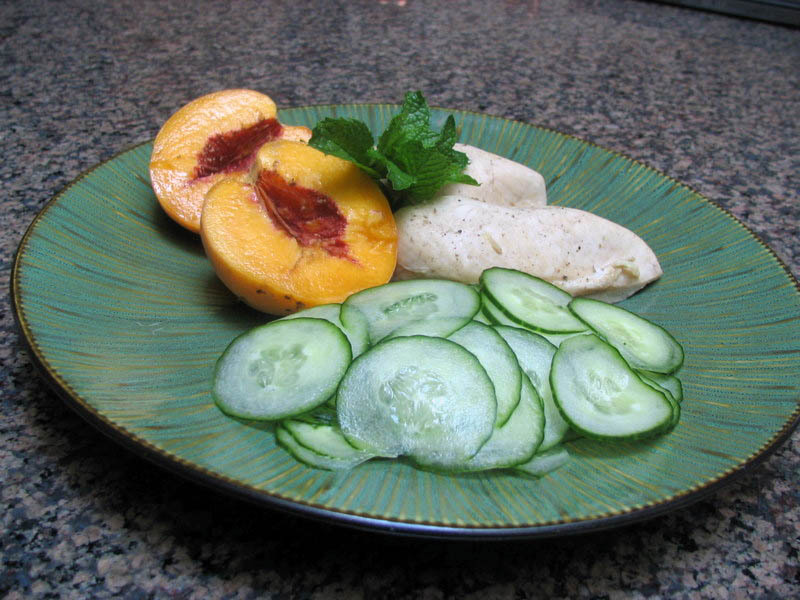 Peel the peaches and also cut them into chunks, slightly smaller than the chicken pieces. Combine the yogurt with the spices and mint. Put all the ingredients in a bowl and mix well. Taste and add a little salt if needed. Season with freshly ground black pepper. jump for more photos and comments…. About poaching the chicken: there are plenty of ways to poach chicken breasts. If you have a favorite method, use it. The most important thing is to cook the chicken very gently, so avoid furiously boiling the water. 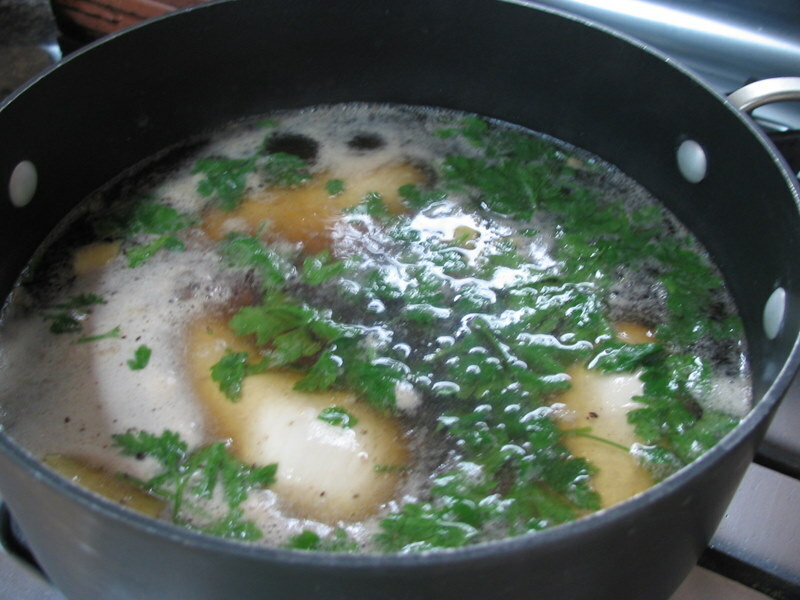 By allowing the mildly flavored liquid to come to a boil and removing the pan from the heat the meat cooks slowly, and won’t become tough or rubbery. I like to add soy sauce because it gives the chicken a slight color and very subtle flavor. You can substitute sherry or white wine, or just cook the chicken in water seasoned with salt and pepper. About the cucumbers: I used those long, English cucumbers, and felt that half of one was plenty. If you prefer regular cucumbers, then add a little salt to the slices and allow them to sit for 10 minutes or so; rinse well. This releases some of the juices that might be a little bitter, and also improves their texture. I don’t bother with this step when using English cucumbers. About the yogurt: If you do not find Greek yogurt, then use regular plain yoghurt, but drain it for a couple of hours to make it denser. The creamier the yogurt, the better! Nothing worse than watery salad! The amounts in this recipe are quite flexible. A little more cucumber will make it taste fresher, more peaches will increase the overall sweetness. Taste before serving and adjust the seasoning according to your own judgment. If you like more crunch in your salad, toasted slivered almonds complement it quite nicely. Leftovers keep well in the fridge, making a perfect appearance at lunchtime! Cozinhe os peitos de frango em uma panela que comporte a todos em uma camada. Adicione agua suficiente para apenas cobri-los, e misture na agua o molho de soja, gengibre, salsinha e sal. Coloque o frango e aqueca a agua ate’ o ponto de fervura. Imediatamente tampe a panela, desligue o fogo e deixe tampado por quinze minutos. Retire o frango, e quando esfriar por completo, corte em pedacos. Corte o pepino em fatias finissimas, salgue as fatias ligeiramente, deixe em uma tigela por 10 minutos para extrair o excesso de liquido. Enxague as fatias, escorra e reserve. Descasque os pessegos e corte em pedacos, de preferencia um pouco menores do que os pedacos de frango. Misture o yogurte com o cardamomo, o coentro moido e a hortela picada, adicione aos outros ingredientes, misturando bem. Ajuste o tempero com sal e pimenta do reino moida na hora. Achei bem interessante o tempero de iogurte com cardamomo, hortelã e coentro. Adoro temperos de salada a base de iogurte!! !